Zlatan Ibrahimovic scored his first goal of the season for Paris St-Germain and Angel Di Maria netted for the first time in French football as the Ligue 1 leaders beat Guingamp. 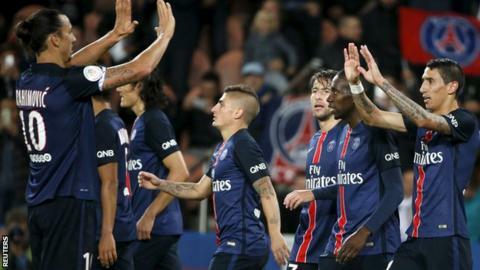 Javier Pastore converted Ibrahimovic's pass for the opener as PSG extended their unbeaten start to the season. Di Maria scored from close range following an Ibrahimovic shot. The £44.3m signing from Manchester United then set up Swede Ibrahimovic's first club goal since May. The striker, who had not scored since netting a double in a 6-0 win over Guingamp last season, had a penalty saved as the reigning champions moved four points clear at the top of the table. Rennes and St Etienne can both trim PSG's lead back to a point as they visit Gazelec Ajaccio and Troyes respectively on Wednesday. Match ends, Paris Saint-Germain 3, Guingamp 0. Second Half ends, Paris Saint-Germain 3, Guingamp 0. Attempt saved. Nicolas Benezet (Guingamp) right footed shot from outside the box is saved in the centre of the goal. Substitution, Guingamp. Mana Dembele replaces Yannis Salibur. Corner, Paris Saint-Germain. Conceded by Laurent Dos Santos. Penalty saved! Zlatan Ibrahimovic (Paris Saint-Germain) fails to capitalise on this great opportunity, right footed shot saved in the bottom left corner. Younousse Sankhare (Guingamp) is shown the yellow card. Penalty Paris Saint-Germain. Edinson Cavani draws a foul in the penalty area. Penalty conceded by Yannis Salibur (Guingamp) after a foul in the penalty area. Goal! Paris Saint-Germain 3, Guingamp 0. Zlatan Ibrahimovic (Paris Saint-Germain) right footed shot from the left side of the box to the bottom right corner. Assisted by Ángel Di María. Foul by Ángel Di María (Paris Saint-Germain). Attempt saved. Maxwell (Paris Saint-Germain) left footed shot from a difficult angle on the left is saved in the bottom right corner. Assisted by Ángel Di María with a through ball. Goal! Paris Saint-Germain 2, Guingamp 0. Ángel Di María (Paris Saint-Germain) left footed shot from very close range to the centre of the goal. Attempt saved. Zlatan Ibrahimovic (Paris Saint-Germain) left footed shot from the right side of the box is saved in the centre of the goal. Assisted by Marco Verratti. Attempt missed. Ángel Di María (Paris Saint-Germain) left footed shot from the right side of the box misses to the left. Substitution, Paris Saint-Germain. Marco Verratti replaces Javier Pastore. Substitution, Guingamp. Jimmy Briand replaces Marcus Coco. Attempt missed. Ángel Di María (Paris Saint-Germain) left footed shot from outside the box misses to the right. Assisted by Javier Pastore. Younousse Sankhare (Guingamp) wins a free kick in the defensive half. Offside, Paris Saint-Germain. Javier Pastore tries a through ball, but Edinson Cavani is caught offside. Attempt saved. Javier Pastore (Paris Saint-Germain) right footed shot from the right side of the box is saved in the centre of the goal. Attempt blocked. Yannis Salibur (Guingamp) right footed shot from outside the box is blocked. Assisted by Younousse Sankhare. Substitution, Paris Saint-Germain. Thiago Silva replaces Gregory Van der Wiel. Attempt missed. Edinson Cavani (Paris Saint-Germain) header from the centre of the box is too high. Assisted by Maxwell with a cross. Offside, Guingamp. Jonas Lössl tries a through ball, but Younousse Sankhare is caught offside. Attempt blocked. Nicolas Benezet (Guingamp) right footed shot from the left side of the box is blocked. Assisted by Laurent Dos Santos. Substitution, Guingamp. Nicolas Benezet replaces Nill de Pauw.